QYLD: How Has The Strategy Been Working Out? My concerns over a turbulent and uncertain 2019 have proven overblown so far, making buy-write strategies look less appealing. However, QYLD yielded an impressive 10.6% annualized in 1Q19 while keeping risks well under control. I believe this ETF continues to be well worthy of consideration, more obviously for income seekers but also for growth investors. Back in December of last year, coincidentally only one week before the end of the 2018 "bear attack," I expressed my concerns over what 2019 could have in store for stock investors. Back then, interest rates had been rising, asset prices falling and volatility in equity prices had definitively picked up the pace. I defended that being a bit creative in putting together a more resilient portfolio for the new year could make sense. More specifically, I discussed the potential benefits of a buy-write or covered call strategy in which generating a more predictable stream of cash (in this case, from dividends and option premiums) might be more appealing than simply hoping for stock prices to rise amid so much uncertainty. Has it been a good year for the buy-write strategy? Fast-forward a bit over one quarter since my last QYLD article (and a 17% market value increase in the Nasdaq 100 index), the macro landscape is now looking much quieter. 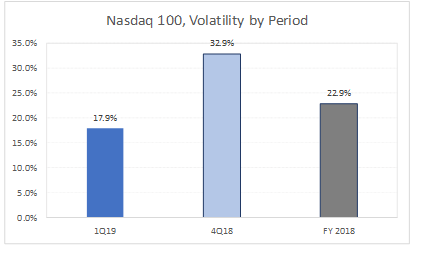 The graph below illustrates how volatility in equities has lowered substantially in 1Q19 as stocks have regained their footing. Such an environment is much more friendly to equity ownership. 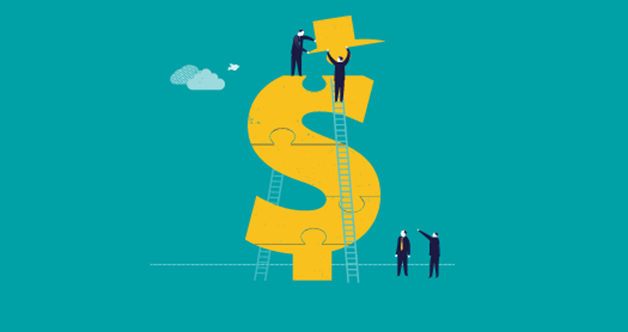 In hindsight, it is easy to say that having plainly invested in a stock index in 2019, at least up to this point, would have been wiser than using the more cautious approach of a covered call strategy. The graph and table below show that QYLD has produced less than half as much return YTD than the fast-recovering, tech-rich Nasdaq index. 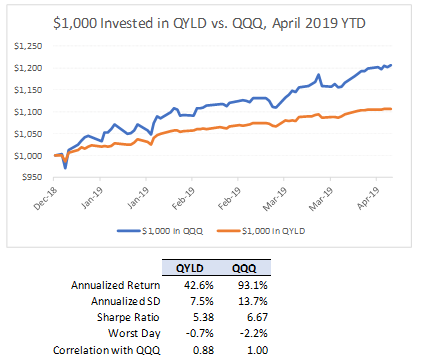 Even on a risk-adjusted basis, and despite having created significantly less volatility, QYLD has noticeably lagged the performance of QQQ this year. However, I would also argue that comparing QYLD against a strong, bullish market will always be a bit unfair. So far this year, the benefits of using a more conservative buy-write investment approach have not surfaced. But being prepared for the less-than-ideal scenarios is an important tenet of prudent investing. I manage my own buy-write portfolio and share my findings and lessons learned with the Storm-Resistant Growth (or SRG) premium community on Seeking Alpha. Since 2017, I have been working diligently to generate market-like returns with lower risk through multi-asset class diversification. To become a member of this community and further explore the investment opportunities, click here to take advantage of the 14-day free trial today.